What are you looking for in an air conditioner? That’s the very first question you have to ask yourself. Are you interested in power or efficiency? Are you looking for a single room solution or a system for cooling your whole home? Do you have an existing air conditioner or the bones of a system in place already? Once you’ve determined what you want, it’s much easier to figure out what you need. AC systems have changed radically over the decades, and if yours is 30 years old and on its last legs you may be surprised at your available options. Are you retrofitting a home? This may limit your options depending on the home size. We recommend considering a ductless system for retrofits. These do not require the installation of ductwork. Do you already have ductwork in place? If so, consider replacing the primary system components. Central air becomes a much better initial option when you already have the essentials installed—especially if your ducts are steel. How large is your home? The larger the home, the more expensive central air becomes. It does not allow for individual cooling like a mini-split system. You can supplement often-used rooms with window AC units to offset this cost. Are you planning on moving soon? Really consider the answer. If you don’t want to stay in your home for the long-haul, buy a cheaper unit. Savings are greater the longer you maintain and use an air conditioner. Higher efficiency models typically cost more. You won’t see any savings if you move soon after. What is the average lifespan of a cooling system? Centralized Air Conditioning System: This is the most common air conditioning system in the United States. It cools an entire home at once using a split system. That means the indoor unit houses an evaporator coil and the outdoor cab houses the compressor and condenser coil. In essence, these cool the air and then pump that cold air throughout the home. Mini Split Air Conditioner: Ductless mini-splits are ideal for larger homes and those with ductowrk. They also feature a split system design. Each room has its own air handler though. Instead of ductwork, air is cooled at the source via coolant pumped throughout the home. This allows you to cool every room individually and really save money over time. Swamp Coolers: Also called evaporative coolers, these units force air and cold water together. That’s the mechanism used to cool the air down. It’s then pumped throughout a home using ductwork, much like a central AC system. These units are very affordable, cheap to run, and easy to maintain. Options are window mounted or portable units. What are the pros and cons of each AC system type? Central Air Standard. Reasonable install cost. Inefficient. Ducts must be maintained. Mini-Split Efficient. Cool single rooms High upfront cost. Must install right. Swamp Cooler Cheap. Easy to maintain. Less cooling power. Moisture in air. 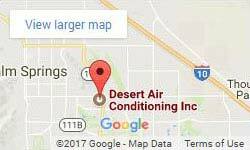 The best air conditioning in Palm Desert is the option that works for you. If you have any more questions about air conditioners, we’d be happy to answer them for you. Sizing should always be based on the size of your home and cooling needs. That will ensure you get the longest life out of your unit without over or under-working it. Until next time, stay cool—if you can’t, give us a call.